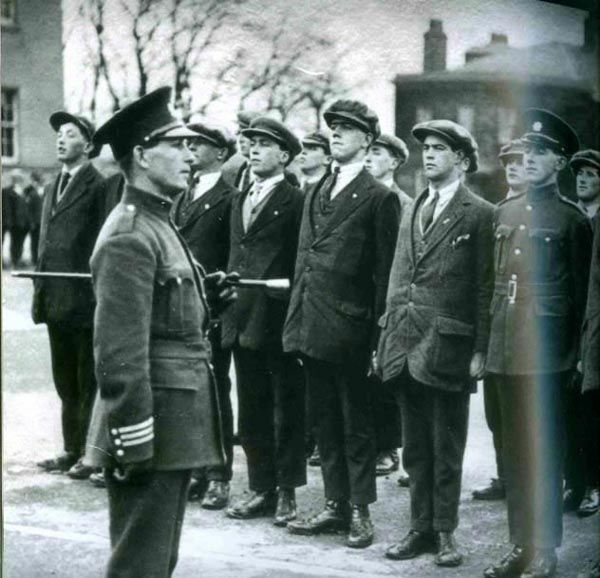 The first Garda Recruits to Join parade for Inspection February 22nd 1922. – Garda No 1 did not join so Garda No 2 was the first Officer of An Garda Siochana. Michael Joseph Staines was born in Newport, Co. Mayo in 1885 and was Commissioner, of the Civic Guard, 21 February – 9 September, 1922, and by virtue of the Garda Síochána (Temporary Provisions) Act 1923, first Commissioner of the Garda Síochána na hÉireann. His national service began in the Gaelic League and Sinn Féin; he joined the Irish Volunteers and was Quartermaster General, G.P.O. Garrison, in the 1916 Rising. On his release from internment in Frongoch, he collaborated with Eamon de Valera, James Ryan, Eamon Duggan and others in founding the New Ireland Assurance Collecting Society, in furtherance of the Sinn Féin policy of investment of national resources at home in Ireland (1918). Alderman, Dublin Corporation; in the General Election, 1918, returned as Member of Parliament at Westminster for St. Michan’s, Dublin, and was present in the Mansion House for the first meeting of Dáil Éireann, 21 January, 1919. Closely associated with Kevin R. O’Sheil in the administration of the National Arbitration Courts and Republican Police. Arrested and imprisoned; released with Arthur Griffith to take part in the Truce negotiations. Appointed a director in the Department of Economic Affairs. In January 1922, the Provisional Government approved the working arrangements for implementing the Treaty (6 December 1921) agreed with the Colonial Office in London. The Royal Irish Constabulary was to be disbanded “as soon as possible”. It was decided to replace the Republican Police with a regular police force under a trained police officer. 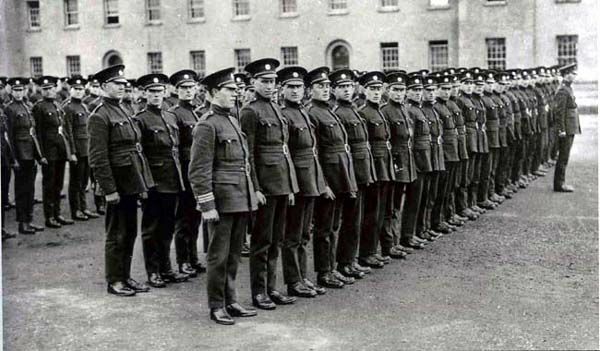 The Chairman, General Michael Collins reported on 28 January that a police organising committee was being formed, to include members of the Royal Irish Constabulary and Dublin Metropolitan Police. The committee held their first meeting in the Gresham Hotel on Thursday, 9 February, with Collins, the Minister for Defence, General Richard Mulcahy, and Home Affairs, Eamon Duggan, and Michael J. Staines among the attendance. Work was started immediately under Staines as acting chairman. A preliminary report was read in a week, and on 21 February the first candidates, recommended by their Volunteer officers, were received by Staines at a temporary Depot, The Royal Dublin Society Showgrounds, Ballsbridge. The name of the Force was decided on 27 February: The Civic Guard; and on 10 March, Staines was formally appointed Commissioner. The following month, Staines transferred his headquarters from Ballsbridge to the Artillery Barracks, Kildare. On 15 May, a faction demanded the removal from high rank of former members of the old Constabulary. Staines was prevented from addressing his men on parade. He wrote to the Minister for Home Affairs (16 May): “I beg to tender my resignation as Commissioner of the Civic Guard. I do so with regret, but in the circumstances which have arisen I can see no other honourable course open (to me)”. A committee of inquiry (Kevin R. O’Sheil and Michael McAuliffe) reported. “Practically all the evidence hedges around the question of the ex-R.I.C. and endeavours to make out that the whole trouble was caused by their presence in the Civic Guard. But the main cause of this disaffection was undoubtedly the propaganda from outside the force aided to a small extent from within, with the object of smashing the Civic Guard..”. On 22 August the resignation of Commissioner Staines was accepted “with regret” his membership of Dáil Éireann and role in Dublin Corporation were deemed incompatible with the responsibilities of the head of the Civic Guard. He remained in office, completing the ground work in the organisation of the new police force. On the day he left office, 9 September, he issued instructions to the Civic Guard defining its future as a moral force in Irish society. 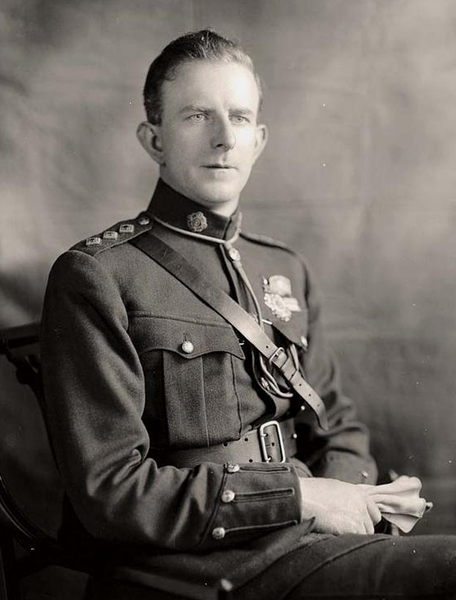 General Eoin O’Duffy (20 October 1892 – 30 November 1944), succeeded Michael Staines as Commissioner of An Garda Síochána from September 1922 until he was dismissed by the incoming Government of Eamon deValera in 1933, He was leader of the 1933 quasi-fascist Blueshirts and the first (extra-parliamentary) leader of Fine Gael (1933-1934). Eoin O Duffy was a native of County Monaghan. O’Duffy did an apprenticeship as an engineer in Wexford before working as an engineer and architect in Monaghan. In 1919 he became an auctioneer. In 1917 O Duffy joined the IRA and had an active part in the War of Independence. He was imprisoned several times but became director of the army in 1921. The following year he became chief of staff of the IRA, replacing Richard Mulcahy. In 1921 he supported the Anglo-Irish Treaty. O Duffy became commissioner of an Garda Síochána (the Civic Guard) when the Irish Free State was established in 1922. “he [O’Duffy] was likely to be biased in his attitude because of past political affiliations”.